Preheat your oven to 220'C / 425'F / Gas 7. Lightly oil a flan baking tin. In a bowl, lightly whisk the eggs and gradually whisk in the sugar until it is thick, creamy and almost white in colour. Sift together the gluten-free flour, gluten-free baking powder and xanthan gum, then lightly fold into the egg mixture, but do not beat. Pour into your prepared tin and bake for just 7-8 minutes. Turn out onto a cooling rack and allow to completely cool. Next, prepare your arrowroot glaze by blending the arrowroot powder with a little of the liquid. Boil the rest of the liquid, then pour onto your arrowroot, mixing well. Return it to the pan and continue cooking until the mixture begins to clear. (If using fruit juice it may not clear but will take on the colour of the juice you have used). 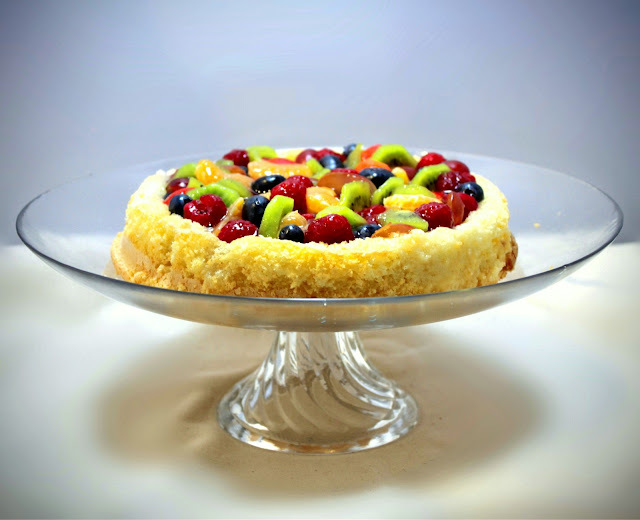 Now prepare your fruity filling and arrange into your sponge flan. Finally, spread the cooled glaze evenly over the flan.